Office 365 is proving to be one of the hits of the SAAS world. The convenience of not having to host the associated infrastructure and central storage capability are not doubt appealing. However organisations must recognise that this is still their data and ultimately they are responsible for protecting it. I previously wrote a whole post on this subject, outlining that Microsoft ensure the data availability of Office 365 but do not offer backup and restore functionality in line with what you would expect in a traditional datacentre. Veeam offer an Office 365 backup product and if you want to have play with it you can now with a free NFR licence. The licence is for 1 year, up to 10 users and is available to all VMware vExperts, Microsoft MVP, VTEC members, Certified Engineers and Trainers. You get an unrestricted version with all the features for use in a test lab environment. You just need to register at this page to receive your NFR key. From what we have found out the Veeam O365 product works fine but the problem is that it is not supported by Mircosoft. This can potentially create problems if issues occurs in a restore situation. We also tried CommVault, whoms method is supported by Microsoft, but the throughput here is terrible. I believe that CommVault is coming out with a new method in 1-3 service packs that will hopefully change this. I an not sure if Veeam are doing anything to get a product that is supported by Microsoft in the future. 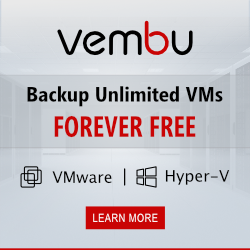 But so fare I think Veeam is the best way so fare for O365 backups – not taken into account the pricing at all.